Where war still rages in eastern Ukraine Jump to media player The conflict in Ukraine is entering its second year and a ceasefire, nominally in place since February, has failed to stop the violence in areas around Donetsk airport. Children living with Ukraine conflict Jump to media player As the conflict in Ukraine continues, Tom Burridge visits a school in Donetsk which is still open, despite being very close to front line and being hit by shelling. Poroshenko: 'I don't trust Putin' Jump to media player Ukraine's president tells the BBC he does not trust Russian president Vladimir Putin and that Ukrainians should prepare for a Russian offensive. 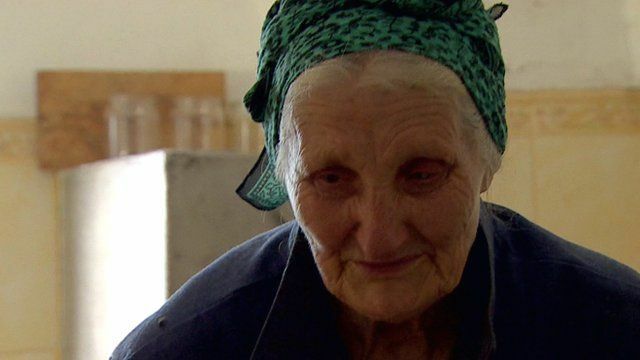 Ukraine crisis: 'We feel abandoned' Jump to media player There is still no ceasefire in eastern Ukraine but fighting is at a lower level than previously. Shells rip through homes in Ukraine Jump to media player Heavy shelling took place overnight in Donetsk. One Ukrainian soldier and two civilians have been killed in the past 24 hours. Russia and US 'must cooperate' Jump to media player The US Secretary of State John Kerry and his Russian counterpart, Sergei Lavrov, speak after talks in Sochi, with both ministers saying their countries have to cooperate. Fears in Odessa over fragile ceasefire Jump to media player The ceasefire between government forces and pro-Russia rebels in eastern Ukraine is largely holding, but Nato's top military commander says he's concerned the lull is being used to prepare another offensive. The conflict in Ukraine is entering its second year and a ceasefire, nominally in place since February, has failed to stop the violence in areas around Donetsk airport. Among the hardest hit is the village of Pisky. It had a population of 3,000 before the war started, but now only a handful of civilians remain. Fergal Keane has been granted exclusive access to the village, which has been sealed off by the Ukrainian army.